Steam kettles heat food indirectly through the use of steam that is inserted and encapsulated in a steam jacket (a secondary wall behind the kettle). The amount of added pressure determines the temperature. Benefits include; faster cook times, uniform cooking and less burning. Typically reserved for larger kettles that are stationary, full jackets cover the entire exterior of the kettle. The spout is usually at the bottom of the chamber to drain the contents. Best for floor models, large kettles, large volume outputs. ⅔ jackets cover only ⅔ of the kettle, leaving the top ⅓ exposed to allow for a spout for easy pouring. This makes partial jacket kettles best for tilting models. Best for tilting kettles, kettles that need easy pouring, countertop models. Am I choosing a countertop or floor model? If you’re already restricted to, say, a countertop model, then know that the size of your kettle will likely be smaller. Countertop models max out at a volume of around 10 gallons. How much do I need to prepare? This question may actually impact whether or not you choose a countertop or floor model, as larger batches (15 gallons or more) will be reserved for floor models only. 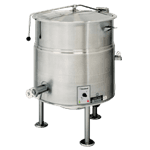 Using a larger kettle will allow you to cook reserves without having to start over with a new batch when business gets busy. Some restaurants will cook larger batches, blast chill a percentage and rethermalize that portion a day or two later. The food quality is almost as good as fresh and time, labor and energy are saved. How often will I need to prepare food in the kettle? If you’re only needing to prepare small batches on a frequent basis, then it may be better for quality purposes to opt for a smaller kettle. If you know that you may hit peak times with larger volumes, though, then you’ll always want to oversize your equipment to accommodate for those rushes. While it’s not optimum, you can cook smaller batches in a larger kettle but not the reverse. Like many of your commercial kitchen appliances and units, kettles also come in gas or electric options. For gas models, you’ll need a natural gas line. Thus, these kettles tend to be used more for larger units because the gas steam producing element is bulky. May require a hood (In any case, hoods are useful to evacuate the heat). Best for larger kettles, floor models, kitchens with gas hookup (where gas costs are lower). While only needing an electric hookup, these models will logically use more electricity than gas counterparts. 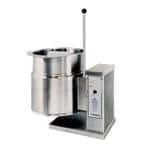 Best for small kettles and kettles needing mobility, countertop models. Steam generators are stand-alone units purchased in addition to your kettle that create steam which is then directed into the unit. Steam generators can be either gas or electric. We’ve mentioned before how some kettles have the ability to tilt. These are similar to tilting braising pans in many ways. The major distinguishing factor between braising pans and kettles is the steam jacket. These are typically safer for large volume productions. Stationary kettles utilize a spigot (various sizes and styles are available) at the bottom of the cavity for easy pouring. Keep in mind that the spout can get clogged, so regular cleaning is required. Best for floor models, large batch productions, liquids and soups with no large chunks that could clog the spout (unless you opt for a large spout, up tp 3’’). All smaller units and on more expensive larger models. A tilting kettle gives users the ability to pour the contents out of a spout formed at the top lip of the kettle. Best for countertop models, small batch productions and “chunky” products. You may be asking yourself whether or not you should choose a kettle over a braising pan if they’re essentially the same. Tilting braising pans tend to scorch foods more readily than steam jacketed kettles, as kettles heat foods indirectly through steam. The benefit to a braising pan is that you’re able to saute or braise items if need be, giving them a slight edge in versatility. A braising pan will allow you to saute first and then add the liquid parts later, giving you the benefits of both the braising and simmering.